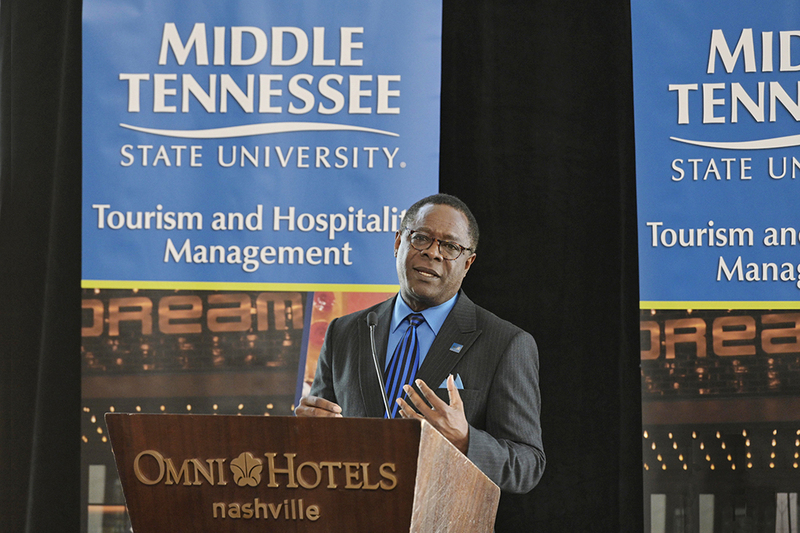 NASHVILLE, Tenn. — MTSU is poised to become one of the premier institutions for furnishing personnel to a burgeoning industry that is critical to the Midstate economy and in need of skilled professionals. 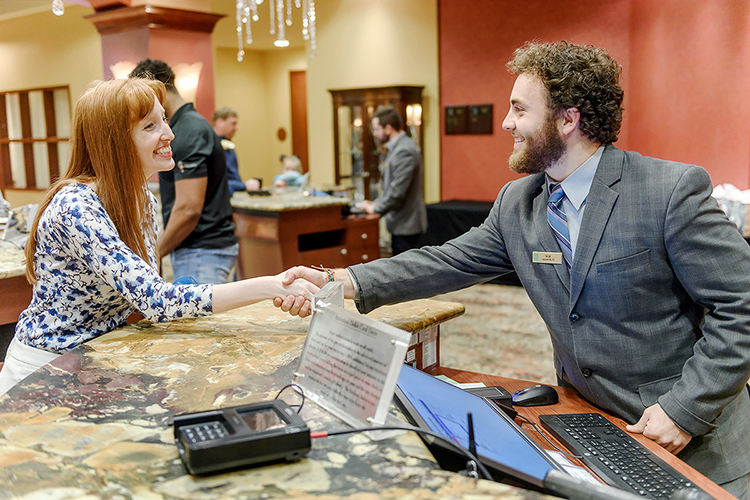 The university announced the creation of a Tourism and Hospitality Management degree Thursday, March 21, in the Grandview Terrace area of one of its partners, the Omni Nashville Hotel. The multitrillion-dollar tourism and hospitality industry supports 1 in 10 jobs worldwide and is growing by about 5 percent each year, according to the World Travel and Tourism Council. That organization projects that the tourism and hospitality field will support more than 413 million jobs by 2028. With industry leaders and university officials looking on, Dr. Joey Gray, an associate professor in MTSU’s Department of Health and Human Performance and coordinator for the Leisure, Travel and Tourism Studies Program, explained that the program has three emphasis areas: travel and tourism, hospitality and hotel, and event planning. Students can choose one or combine all three. The program includes an advanced bachelor’s to master’s degree track that will enable students to graduate with both degrees in five years, putting graduates into the workforce more quickly. 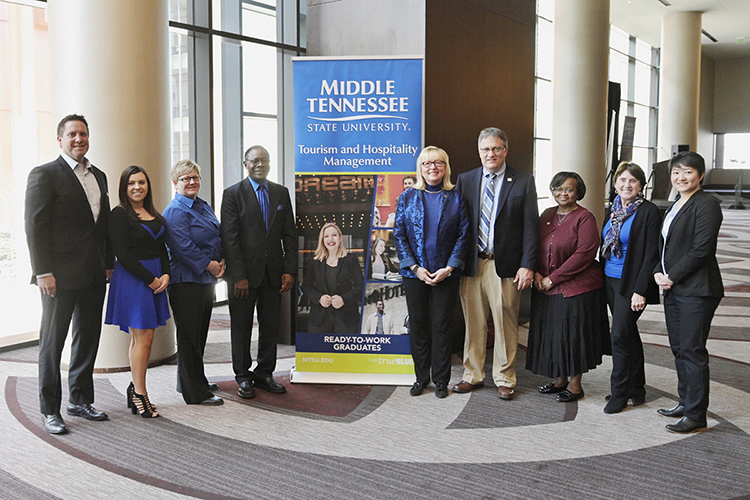 MTSU is uniquely well-positioned to offer the degree because of its existing leisure, sports and tourism classes in the Department of Health and Human Performance in the College of Behavioral and Health Sciences, supporters said. Murfreesboro native Brooke Culver, who will graduate this May with a degree in sports and tourism management, already has a wide variety of internships and other work experience to show future employers. She’s worked at Arrington Vineyards in the wine tourism industry, in character performance for Walt Disney World and in field studies with Hilton Hotels and Resorts. 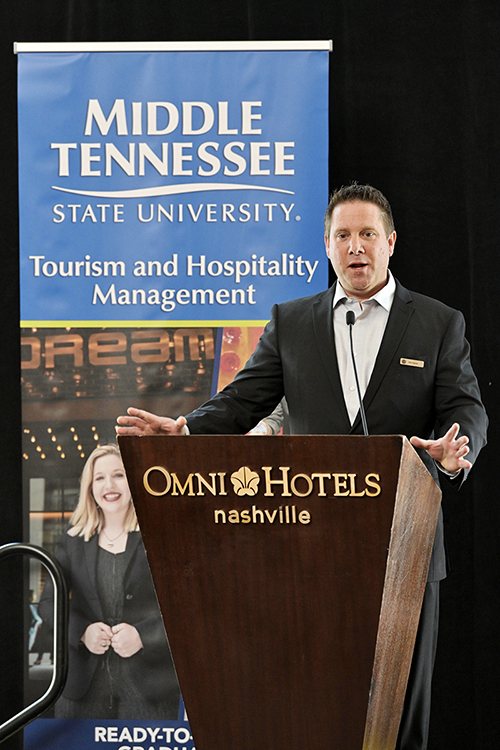 Omni Hotel General Manager Eric Opron applauded MTSU’s development of a program that he said will serve as a pipeline of talented graduates attractive to his company and others. Along with the Omni Nashville, partners in supporting the new program include the Nashville Area Chamber of Commerce, the Tennessee Recreation and Parks Association, the Rutherford County Hospitality Association, Embassy Suites, Nashville Convention & Visitors Corporation; the Tennessee Hospitality and Tourism Association and the Rutherford County Convention & Visitors Bureau. “We are committed to putting out the most educated, the most well-prepared graduates that will not only represent our university very well but will also take this industry to the next level,” McPhee said.